For more information on the Church-Approved apparitions of Itapiranga, Brazil, please visit the official website: www.santuariodeitapiranga.com.br Letter of approval by Bishop Carillo Gritti here. Special thanks to Ana Ormonde for translating these messages into English. In this apparition, St. Joseph appeared dressed in a white tunic with a blue robe, accompanied by several angels. St. Joseph held a lily bud and revealed to me his Heart. My dear son, Our Lord God has sent me to tell you about all the graces the faithful will receive from my Most Chaste Heart which Jesus and my blessed spouse wish to be honored. I am St. Joseph and my name means "God will grow," because I grew every day in grace and divine virtues. Through devotion to my Chaste Heart many souls will be saved from the hands of the Devil. God our Lord has allowed for me to reveal to you the promises of my Heart. Just as I am fair and righteous in the sight of God, all who have devotion to my Heart will also be chaste, righteous and holy in His sight. I will fill you with these graces and virtues, making you grow every day on the road of holiness. This is all I will reveal to you on this day. I give my blessing to you my son, and all mankind: in the name of the Father and of the Son and of the Holy Spirit. Amen! 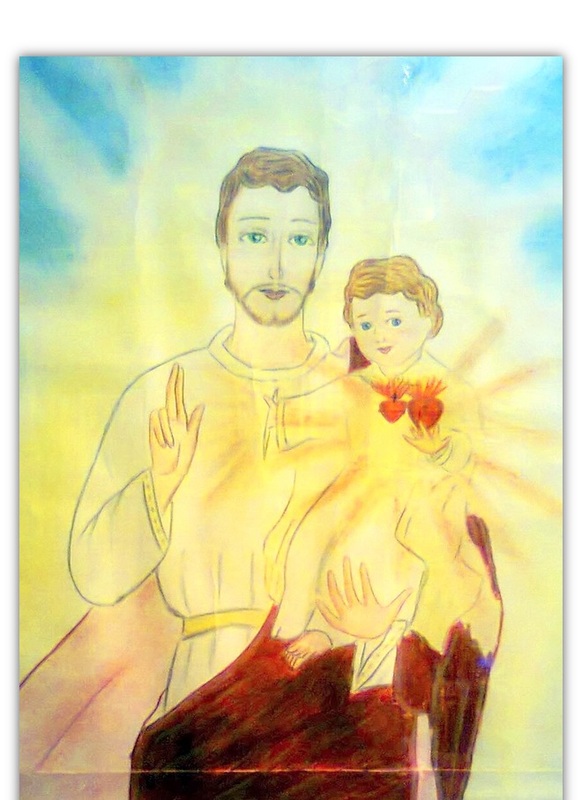 St. Joseph appeared with the Child Jesus, with a red mantle and a white tunic. The Boy Jesus had his head inclined on St. Joseph's Heart, playing with the lilies he held in his hands. St. Joseph had brilliant green eyes and a beautiful smile – he appeared to be very young with an indescribable beauty. With one of His little hands, the Child Jesus opened the illuminated chest of St. Joseph. In His other hand, Jesus held the Most Chaste Heart of St. Joseph. Here in this Heart you will find me living, because it is pure and saintly. That all hearts could be like this one, so they could be my home on earth. Imitate this Heart so that you may receive my graces and blessings. St. Joseph: My beloved son, today I bless you, I bless your mother and all your family. My beloved son, God, Our Lord, wishes to give all humanity countless graces, through devotion to my heart. My son and Lord Jesus, that I brought up here on earth, with a father's love, desires that all men practice devotion to my Heart, for all those in need of graces from heaven. He also asks that men help others in need with their good deeds. I promise to all that honor this Most Chaste Heart of mine and who do here on earth good deeds in favor of the most needy, especially of the sick and dying for whom I am a consoler and protector, to receive in their last moment of their lives the grace of a good death. I myself will be to these souls their petitioner to my Son Jesus and, together with my spouse, Most Holy Mary, we will console them in their last hours here on earth, with our holy presence and they will rest in the peace of our hearts. Just as you saw my Son Jesus repose His head on my heart, this way myself and my spouse Holy Mary will take these souls to the glory of paradise, in the presence of their Savior, my Son Jesus Christ, so that they may repose, and incline themselves to His Sacred Heart, in the burning furnace of the most pure and loving Heart. I give you my blessing: in the name of the Father and the Son and the Holy Spirit. Amen. St. Joseph came dressed in a white tunic and a white cloak, holding a lily and the Child Jesus, also in white, on his lap. My beloved son, listen and make it known to all men, what God has permitted me to reveal to you. My beloved son, how sin spreads in a such a strong way! Men let themselves be led by the most insidious wiles of the Devil. The enemy of salvation wants to destroy all men so that, this way, all will be lost. He is envious and hates the entire human race. So many go through trials and temptations, that the enemy of God throws at every moment, this way trying to destroy mens' mortal souls that were created by God. The means that he most utilizes are the sins against holy purity, because purity is one of the virtues most beloved by God, and in this way Satan desires to destroy the image of God present in each creature through this virtue. And it is because of this, that God asks all humanity to have devotion to my Chaste Heart, he wants to give men the grace to overcome the temptations and attacks of the Devil in their day to day lives. The invocation of my name is enough to make demons flee! I promise to all the faithful that honor my most Chaste Heart with faith and love, the grace to live with holy purity of soul and body and the strength to resist all attacks and temptations by the Devil. I myself will preciously protect you. This grace is not only destined for those who honor this heart of mine, but also for all their family members who are in need of divine help. I give you my blessing: in the name of the Father and of the Son and of the Holy Spirit. Amen. St. Joseph came dressed in a wine colored cloak with a green tunic. He held a staff in his right hand and showed his Chaste Heart streaming intense rays of light. My beloved son, today is the first Wednesday of the month. On every first Wednesday of the month, my Chaste Heart pours numerous graces on all who rely on my intercession. On these Wednesdays, men will not receive a shower of simple graces, but very strong torrents of extraordinary graces! I will share them with those who honor me and rely on me, all the blessings, all the virtues, and all the love I received from my Divine Son Jesus and my spouse the Blessed Virgin Mary while still living in this world and all the graces that I continue to receive in the glory of paradise. My beloved son, what a great honor and dignity I received from the Heavenly Father, that made my Heart exult with joy! The Heavenly Father granted me the honor of representing him, in this world, to take care of his Divine and Beloved Son, Jesus Christ. My Heart was also surprised by so such dignity, I felt incapable and undeserving of such a great favor and benefit, but I put all in the hands of the Lord and, as his servant, I was ready to do his holy will. Think, my beloved son, what joy I felt in my Heart! The Son of the Most high was now in my care and was known by all men as my legitimate son. To the eyes of the world it was impossible, but for God everything is possible when he so desires it. Because of this great grace and joy that God granted my Heart and, by such great mystery, I promise to intercede before him for those who come to me, honoring this Heart of mine. I will give them the graces to be able to resolve the most difficult problems and urgent necessities, that to the eyes of man seem impossible, but that, through my intercession to God, will be possible. I grant the graces of my Heart to all sinners so they may convert. My Heart grants its rays of love on the entire Holy Church, particularly on my Son Jesus Christ's Vicar, Pope John Paul II*. No one, such as he, has special access to this Heart of mine. That he may trust in my Heart and in my intercession, I am to the Holy Father like a father and protector. I give my blessing: in the name of the Father and the Son and the Holy Spirit. Amen. *8/15/89, Pope John Paul II released the Apostolic Exhortation REDEMPTORIS CUSTOS (Guardian of the Redeemer) that speaks of the life and mission of St. Joseph. The Holy Family appeared: St. Joseph was in a beige cloak and blue grey tunic, in his arms was the Child Jesus wearing a very bright blue tunic. Our Lady was in a white veil and blue grey dress. My beloved son, my Heart desires to spill many graces this night on all men, because I desire the conversion of all sinners so that they may be saved. That all sinners may not be afraid to approach my Heart, I desire to welcome and protect them. Many are those who are distant from God because of their grave sins. Many of those, my children, are in that state because they let themselves fall to the wiles of the Devil. The enemy of salvation makes them think there is no solution, nor return, because they have despaired and have not trusted in divine mercy. These will be easy targets for the Devil. But I, my beloved son, tell all sinners, even those who have committed the most terrible sins, to trust in the love and in the forgiveness of God and to trust in me also, in my intercession. All those who trustingly have recourse to me will have the certainty of my help to recover the divine grace and mercy of God. Look, my son, what the Heavenly Father entrusted to me to take care of: his Divine Son Jesus Christ and the Immaculate spouse of the Holy Spirit. My Heart felt a great peace and joy for having Jesus and Mary at my side in the same house. Our three hearts loved one another. We lived a Trinitarian love, but it was a love united in the act of offering to the Eternal Father. Our hearts melted into the purest love as though becoming one heart living in three persons. But look, my son, how much my heart grieved and suffered in seeing my Son Jesus so little and already in danger for his life because of Herod that, taken by an evil spirit, ordered the killing of the innocent children. My heart went through great tribulation and suffering because of the great danger my Son Jesus suffered, but our Heavenly Father did not abandon us in that moment, he sent his messenger angel to direct me and what attitude to take in those difficult moments of suffering. Because of this, my son, tell all sinners to not despair in the great dangers of life and in the dangers of losing one's soul. I promise all who will trust in my most pure chaste Heart, devoutly honoring it, the grace to be consoled by me in their greatest afflictions of the soul and in the danger of judgment, when by misfortune lose divine grace because of their grave sins. To these sinners, who have recourse to me, I promise the graces of my Heart for the purpose of amendment, of repentance and of sincere contrition of their sins. Now, I say to all sinners: Do not be afraid of the Devil and do not despair because of your crimes, but come throw yourselves in my arms and take refuge in my Heart so that you may receive all the graces for your eternal salvation. Now I will give the world my blessing: in the name of the Father and of the Son and of the Holy Spirit. Amen. My beloved son, I would like to speak anew about the graces my Chaste Heart wishes to shower upon all humanity. My Chaste Heart, by the impulse of love, searches all ways to save all men from sin. My Son Jesus, through my Heart, wishes to impart to all men his divine blessings. I know many of you suffer many great difficulties because, in these last times, men no longer love or help one another but live with their hearts full of pride, falsehood, lies, intrigue, ambition, backbiting, pettiness, and many wrong things that are the consequences of living far from God. My son, look at how much I suffered beside my Son Jesus and my Spouse the Blessed Virgin Mary! Like I have told you, I received from God the mission to be the guardian and protector of Jesus and Mary. My Heart was anguished because we did not live in the best of conditions in life, though I searched for a way to give a dignified life to the Son of the Most High. The only means I had to bring home our daily bread was through my work as a carpenter. Work did not always have its adequate profit. Life had its problems, but I always trusted in Divine Providence. This was always our assistance for what was necessary for the survival of my beloved Son Jesus Christ. My heart, would become distressed because I felt I was not giving my Son Jesus a dignified life. God permitted me to go through this so that I would grow to trust in his Divine Providence. The virtue of humility would adorn my soul and I would be an example to all men and workers, so that they would also fulfill their duties and work with patience and love. My beloved son, to all who honor this Heart of mine and trust in me and in my intercession, I promise they will not be abandoned in their difficulties and in the trials of life. I will ask Our Lord to help them with his Divine Providence in their material and spiritual problems. Mothers and fathers, consecrate yourselves to my Heart, likewise your families, and you will receive my help in your afflictions and problems. Just as I brought up the Son of the Most High in his holy laws, I will assist you with the upbringing and education of your children. I will help all fathers and mothers that consecrate their children to me, to bring them up with love in the holy laws of God, so they may find the secure road to salvation. Now I tell all men: consecrate yourselves to my Chaste Heart. Consecrate all to me: your lives, your families, your jobs. Consecrate all to me, because my Heart is the new font of graces that God concedes to all humanity. I extend my cloak over the whole world and all the Holy Church. Trust in me and you will receive all graces. I give you my blessing: in the name of the Father and of the Son and of the Holy Spirit. Amen. St. Joseph came in a leaf-green cloak and dark gray tunic. Our Blessed Mother came in a blue mantle and white dress with a white veil. The Child Jesus came in a light yellow tunic. St. Joseph held the right hand of the Child Jesus. My beloved son, this night I, my Son Jesus and my spouse the Blessed Virgin, bless you in the name of the Father of the Son and of the Holy Spirit. My beloved son, my Son Jesus is very indignant with the sins of humanity. He desires to pour his divine justice upon all men that do not want to repent and continue obstinately in their sins. Look, my son, I hold his right hand, preventing Him from pouring out his justice upon all humanity. I ask Him, through the graces of my Heart and for being worthy to live by his side, taking care of him with the love of a father in this world, and for Him having loved me with the love of a son, to not chastise the world for its crimes, but for all my little ones who honor and will honor this Chaste Heart of mine, should pour out his mercy upon the world. How many sins are committed in the world, my son! It is necessary that men do much penance, that they repent of their errant attitudes, because God receives continued offenses from ungrateful men. Today there are so many outrages, the sacrilege and indifference by all men. It is because of this that so many calamities like war, hunger and disease occur and so many other sad things man has suffered because of mans rebellion against God. God lets men follow their own paths to show them all, without him, they will never be happy. He lets men go through so much suffering, to also show them the consequences sin brings to their lives and so then the divine justice punishes humanity because of their obstinance in not being obedient to God's Will. Because of this, my beloved son, in these last times, humanity follows increasingly obstinate in their crimes, because what matters most for him are the pleasures of worldly things, rather than the love of God and his Commandments. But God's justice is close at hand in a way never seen before and will come about suddenly upon the whole world. So then, my son, tell all those that honor this Chaste Heart of mine they will receive the grace of my protection from all evils and dangers. For those who surrender to me will not be slaughtered by misfortunes, by wars, hunger, by diseases and other calamities, they will have my Heart as a refuge for their protection. Here, in my Heart, all will be protected against the divine justice in the days that will come. All who consecrate themselves to my Heart, honoring it, they will be looked upon by my Son Jesus with eyes of mercy, Jesus will pour out his love and will take to the glory of his Kingdom all those I put in my Heart. This is my message for tonight. I bless you: In the name of the Father and of the Son and of the Holy Spirit. Amen. St. Joseph was dressed in a dark maroon tunic and light maroon cloak, surrounded by twelve angels with large wings. My beloved son, my Heart exults in joy by these encounters, I want to pour out these graces that the Lord has permitted me to give. I want, through my Heart, to lead all men to God. Here, in my Heart, all men are protected and through it they will understand the love of God in their lives. My son, all those who propagate the devotion to my Heart, and practice it with love, have the certainty of having their names engraved on it just as my Son Jesus' cross and the "M" of Mary are engraved on it, as formed by wounds. This also applies for all priests whom I love with predilection. The priests who have a devotion to my Heart and spread it will have the grace of touching the most hardened hearts and convert obstinate sinners. That all may spread devotion to my Heart, it is God Himself who asks it. For all those who listen to my plea, I give my blessing. You are to spread this devotion to all men, my beloved son, as you are designated by God to be the apostle of my Heart. Tell all of my love! Later I will come to speak to you about other things that will be very important for the salvation of many souls. God has entrusted you with a great mission – trust in me and you will know how to truly realize it. I give you my blessing: in the name of the Father of the Son and of the Holy Spirit. Amen. St. Joseph came, in a burgundy cloak and white tunic, with Our Lady, in a blue mantle and white dress. The Child Jesus, all in white, was sitting on St. Joseph's lap. My beloved son, this night I, my Son Jesus and my Most Chaste Spouse St. Joseph bless the whole world. I ask you to listen and to live the holy messages of God. Convert. Continue to pray the holy Rosary everyday and, particularly, beloved son, the seven Apostles’ Creeds, because here in the Amazon there will be a great loss of faith. It is because of this I ask you to always pray the seven Creeds, since many will loose their faith and abandon the Holy Church in the difficult moments to come. I, your Mother, ask you to continue to pray to prevent that great danger and those difficult days during which many will suffer. All who honor the Most Chaste Heart of St. Joseph will benefit with my maternal presence in their lives in a special way. I will be at the side of each son and daughter of mine, helping and comforting them with a Mothers' Heart, just as I helped and comforted my Most Chase Spouse Joseph in this world. To those who ask of his Heart with trust, I promise to intercede before the Eternal Father, my Divine Son Jesus and the Holy Spirit. I will obtain for them, from God, the grace to reach perfect sanctity in the virtues of St. Joseph, this way reaching the perfect love in which he lived. Men will learn to love my Son Jesus and myself with the same love as my Most Chaste Spouse Joseph, receiving the most pure love from our Hearts. My Son Jesus, my Chaste Spouse Joseph and I are at your side. Fear nothing, because our hearts will protect you always. I give you my blessing: in the name of the Father and of the Son and of the Holy Spirit. Amen. At the end of this message the Holy Family gave their blessing and as they were rising to Heaven, Our Lady said: In the end our united Hearts will triumph!